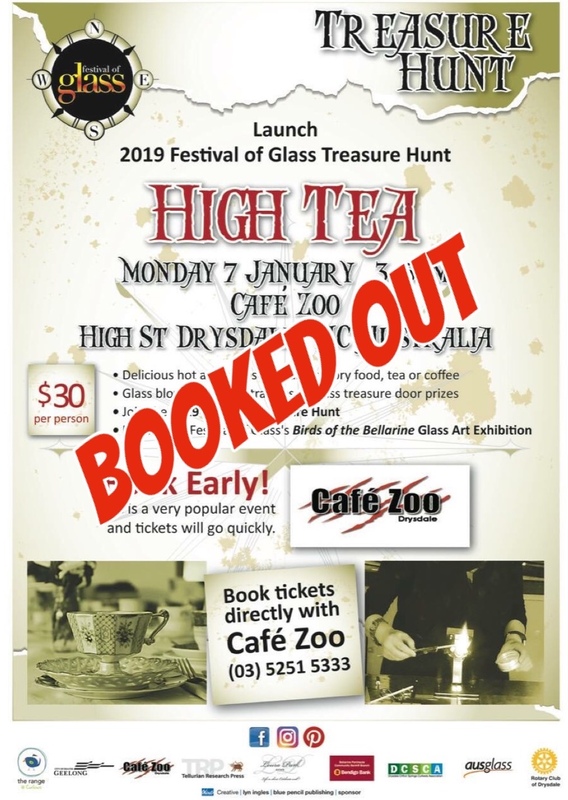 A High Tea at Café Zoo in Drysdale on Monday 7 January will launch the 2019 Festival of Glass Treasure Hunt. The High Tea was booked out two weeks in advance and, not surprisingly, owner Marc Rodway is delighted. “It will be a great start to this year’s Festival of Glass and to its Treasure Hunt”, he said. High Tea guests can watch local glass artist Glenda MacNaughton blowing and sculpting glass and browse the “Birds of the Bellarine” glass art exhibition that runs until March. Thirty three businesses in Curlewis, Drysdale, Clifton Springs and Portarlington are involved in the Treasure Hunt, which has over a hundred prizes of locally-made glass art. DCSCA is working with the City of Greater Geelong as it initiates the design of an artificial reef and/or sculpture offshore from The Dell, in Clifton Springs. 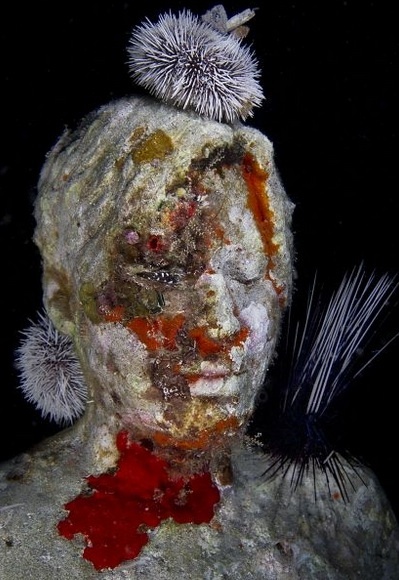 Marine life reclaims the space! Such a structure would increase the area's attraction as a leisure and creation centre by encouraging snorkelling and creating a picturesque view from The Dell Lookout; and it would increase fish numbers by improving the marine environment. DCSCA has lobbied the council and tourism bodies for the creation of such a structure since 2013. 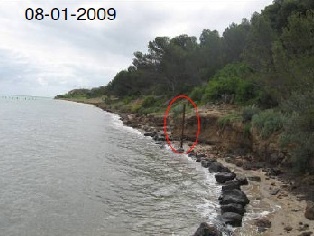 Its lobbying has included a 2015 Community Budget Submission to the council calling for an artificial reef for The Dell; and in 2016, DCSCA added its voice to those of the Boating Industry Association of Victoria and Tourism Greater Geelong and The Bellarine in calling for an underwater sculpture gallery off Clifton Springs. Now, after six years of false hopes and false starts, it seems that this idea’s time has come. DCSCA congratulates the council for initiating the design and marketing of the reef/sculpture and will work with the council to ensure that the structure reflects local people's views about the area and its future. Drysdale’s High Street arcade will receive a major makeover from the local community association. The Drysdale, Clifton Springs, Curlewis Association (DCSCA) and its Festival of Glass sub-committee have received almost $11,000 from the federal government’s Stronger Communities Programme to design and create a glass mural for the arcade. Entitled “Yesterday, Today & Tomorrow”, the mural will depict the past, present and possible futures of the northern Bellarine Peninsula, celebrating the local community to itself and to the area’s many visitors. The DCSCA committee will invite local community, recreational and sporting groups to join in designing and creating twelve glass mosaic panels that will form the mural. Each mural panel will depict a theme or feature of the north Bellarine and will include a visual puzzle to encourage people to actively engage with it, not just admire it. The arcade’s owners and tenants are enthusiastic supporters of the project, recognising that the mural will make the arcade a brighter, safer and more inviting space, benefiting businesses within it and pedestrians passing through it. DCSCA expects to complete the arcade mural by April 2019. It will be a further boost to the area's reputation as a centre of glass art, joining DCSCA's earlier Welcome to Drysdale glass mural on Drysdale’s ‘Village Green’, its annual Festival of Glass (now 9 years old) and its glass art mentorship programme. The Stronger Communities Programme provides $150,000 to each federal electorate to fund small capital projects that improve community participation. Each Federal MP identifies appropriate projects and invites their authors to apply to the Programme for a grant. Up to 20 projects in each electorate will each receive $2,500 to $20,000. 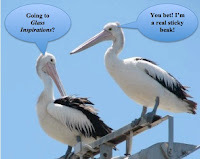 Monday 3rd December 2018 will see the opening of Glass Inspirations – an exhibition of local glass art at Drysdale’s Café Zoo with the theme “Birds of the Bellarine Peninsula”. The exhibition is the first event in the 2019 Festival of Glass, initiated in 2011 by the Drysdale & Clifton Springs Community Association (now the Drysdale, Clifton Springs Curlewis Association). A sub-committee of the Association runs the annual Festival. Local glass artists have created a variety of small and large pieces of glass art jewellery and sculptures for Glass Inspirations. Each piece will be unique and hand-crafted on the Peninsula, making them ideal gifts. Visitors to Glass Inspirations can admire the pieces of glass art, identify the birds and, perhaps, buy one of these unique pieces. If the pressure of having to choose gets too much, Café Zoo can always supply a restorative snack! Glass Inspirations will run from Monday Dec 3rd to Monday February 11th 2019, between 9.00am and 5.00pm at Café Zoo, 23 High St, Drysdale. DCSCA has proposed a joint project with the City of Greater Geelong (CoGG) to revive the mineral springs from which Clifton Springs gets its name. We believe that at least 3 springs have their outlets between the high and low water marks on the Clifton Springs beach. 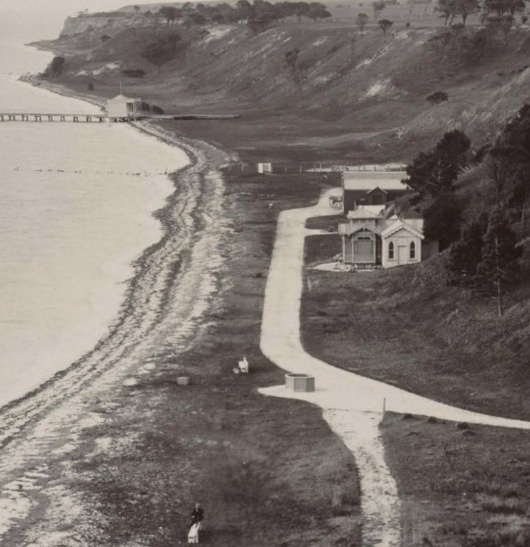 Originally, they were well above the water line and were the focus of the Clifton Springs spa in the 19th and early 20th centuries, where people from the Geelong and Melbourne regions came to "take the waters" for their alleged health-giving properties. More recently, the water from the springs has been declared unfit for drinking - ironic, given the early claims that it improved drinkers' health! For this reason, the area has been allowed to deteriorate. 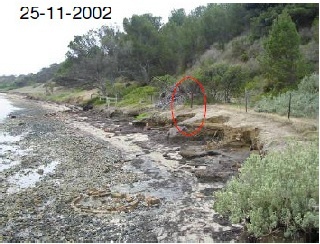 Coastal erosion continues to take its toll on the site (see the two photos), with the result that the springs outlets are now submerged by the incoming tide. DCSCA would like the historic springs that gave Clifton Springs its name to “live on” and enhance the experience of visitors to the area. 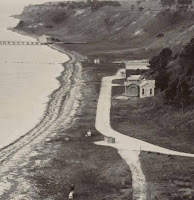 More specifically, we would like the spring water outlets to be revived as an historic feature, visible from the planned boardwalk that will go around the nearby promontary. 1. Identify and record the location of the spring water outlet (at low tide!). Place a temporary 'collar' (e.g. a concrete tube) over each outlet, so that the spring water discharges above the high water level. 2. Ensure that the boardwalk offers suitable points from which to view all of the spring water outlets and include pointers to each spring, plus information about them, in the fabric of the boardwalk. 3. On completion of the boardwalk, replace the temporary 'collars' with more attractive structures. Invite local artists (e.g. sculptors, glass artists) to submit expressions of interest in creating one or more of these features; and invite local schools, groups, clubs and residents to suggest design ideas. * A. S. Miner Geotechnical (2011) Coastal erosion and stability study: Clifton Springs. Report to City of Greater Geelong . p22. Treasure Hunt launch booked out! 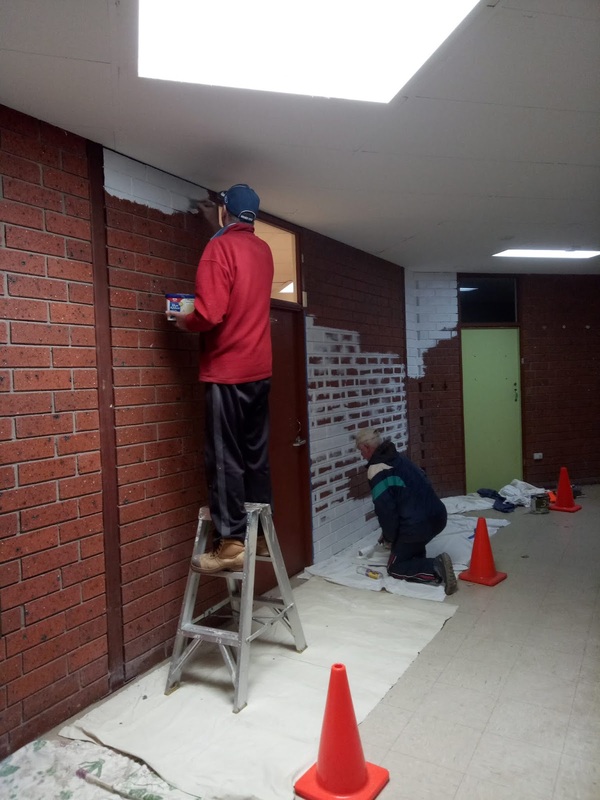 Wall-to-wall support for Drysdale mural!